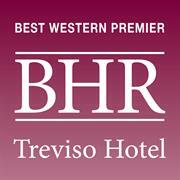 BEST WESTERN PREMIER BHR Treviso Hotel is a modern 4* hotel with international standards, located in Treviso at just 30 km away from Venice. The hotel features 133 comfortable rooms all with extra-size bed, including 17 junior suites and a presidential suite, connecting rooms for families and rooms for people with reduced mobility. At guest’ disposal: large and modern congress centre with the lastest facilities for 1200 people, DiVino Restaurant and Gioja Lounge Bar, panoramic Wellness & Fitness Centre, shuttle service, outdoor car park and covered parking garage, Wi-Fi, bike rental.